DSC and Noga officials at the meeting. A high-level delegation from Bahrain's National Oil and Gas Authority held discussions with Dubai Supreme Council of Energy (DSC) to boost co-operation with the entity and discuss best practices in the energy sector. The meeting is within the framework of mutual visits with organisations and entities operating in the energy, oil, and gas sector, said a statement from DSC. 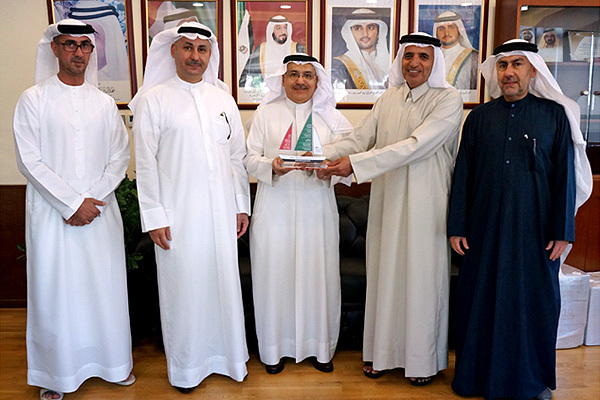 Ahmed Buti Al Muhairbi, the secretary-general of the Dubai Supreme Council of Energy, received the visiting delegation headed by Jassim Issa Al Shirawi, the director-general of Oil and Gas Affairs and Hisham Zabari, senior advisor in the Oil and Gas Authority at his office in Dubai. During the meeting, the parties reviewed the demand side management strategy that aims to reduce energy and water demand by 30 per cent by 2030, and the Dubai Clean Energy Strategy 2050, which aims to diversify the energy mix so clean energy will generate 75 per cent of Dubai’s total power output by 2050. The delegation was briefed on the experience of the Dubai Supreme Council of Energy, and its most important programmes and initiatives. This supports the vision of the wise leadership to achieve the Dubai Plan 2021, to make the emirate a smart, integrated, and connected city that sustainably manages its resources, said the statement. At the meeting, Al Muhairbi stressed upon the importance of such meetings which enhance joint co-operation, as well as review the latest developments and best practices in the energy sector.